Dies R Us: A Happy Hello! Welcome back, friends! And a happy hello!! It's hard to believe that April is almost over and May is just around the corner! I thought a sweet little card to celebrate spring would be in order today. Like a lot of you, I enjoy sending cheery little cards to friends who need perked up! The minute I saw this digi from Tiddly Inks, I knew it would go for one of those cards. 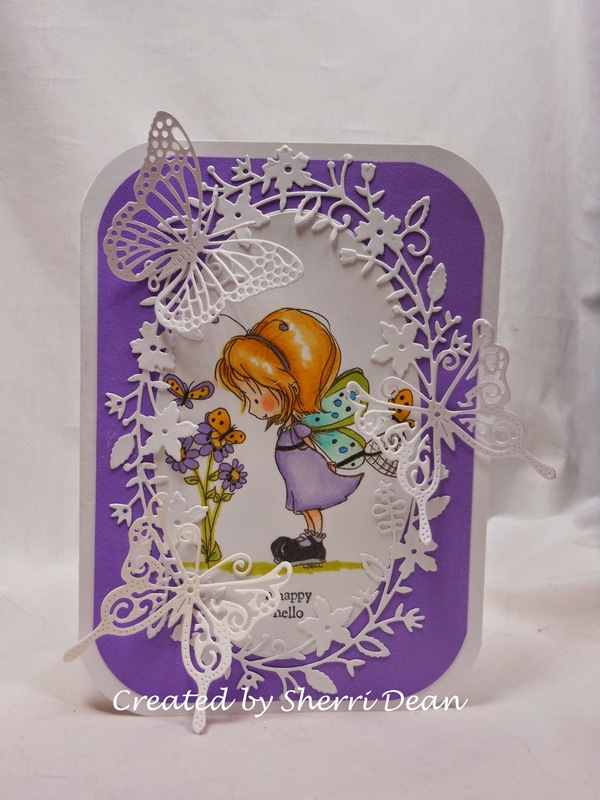 In keeping with the flowers & butterflies in the image, I wanted my dies to reflect the same theme so I went with Memory Box Fairytale Flower Frame and Cheery Lynn Exotic Butterflies Small #2. These dies will become part of your "go-to" dies that you use again & again & again! We also have dozens of other gorgeous butterfly dies as well if you have favorites of your own you want to use. Although I don't normally make a lot of lavender or purple cards, I'm glad I got out of my comfort zone with this one as I LOVE the color! I hope the recipient does as well! Don't forget to join in on the Dies R Us Challenges on our Challenge Blog for a chance to win a gift certificate to shop! I'll see you next week! Happy crafting! !